When I lived in London the agency I worked for allowed us five duvet days a year. This meant we could just be 'off' without any real reason other than that we wanted to crawl back under our duvet for the day and stay there. Years later I still think about that duvet day and the beauty behind the idea. And if I were to take one, it would be here, in this beautiful bedroom. Oh the power of pictures against an all white backdrop. Could you spend a 'duvet day' here?! Emma Persson Lagerberg. Photography Petra Bindel. My two favourite beddings: The Fold jersey sheets, duvet covers and pillows from The Beach House Company (trust me, it's like sleeping in your favourite t-shirt) and this linen bedding. For the cutest children's bedrooms inspiration how about this Finnish bedroom, a girls room in earthy greens and dusty pinks and one of my all time favourites: a vintage inspired little girls bedroom. Lie-in, relax and have a lovely (duvet?) day! PS did you know that in Scandinavia it's customary to have two single duvets on a double bed?! it is a very "cold" minimalism... too cold for me, mainly for a bedroom.. It's the home of Emma Persson Lagerberg. I suspect the photography is Petra Bindel. "PS did you know that in Scandinavia it's customary to have two single duvets on a double bed?! " What would you have in the UK, for example? Only a single large one? 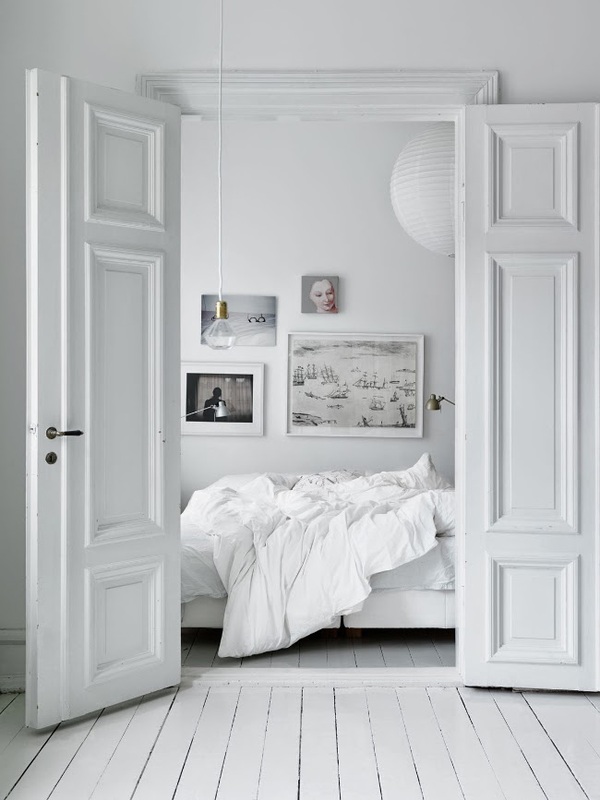 This is a gorgeous bedroom and duvet days are the best idea anyone could possibly have come up with! My husband and I discovered the the single duvet thing when we traveled round Sweden for our honeymoon - wasn't quite what we had in mind! We still had a great time, though, and hope to return very soon with our daughter who came along not that long afterwards ;)! This is a truly gorgeous bedroom! I like the idea of two duvets (doona in Australia), I think you would stay warmer but wondering how you dress the bed?